Like elements of arrays, elements of a cluster are ordered. Unlike elements of arrays, the elements of a cluster are not ordered by their positions in the cluster but by the order in which the elements are added to the cluster. The first object you place in the cluster is element 0, the second is element 1, and so on. You can verify the order of elements in a cluster and reorder them as desired. A cluster groups data elements of mixed data types. Grouping related data elements into clusters allows you to keep them together while you program. 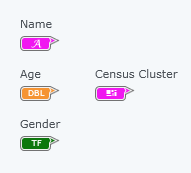 For example, you can use a cluster to store a person's name, age, and gender instead of storing this data in three separate controls. 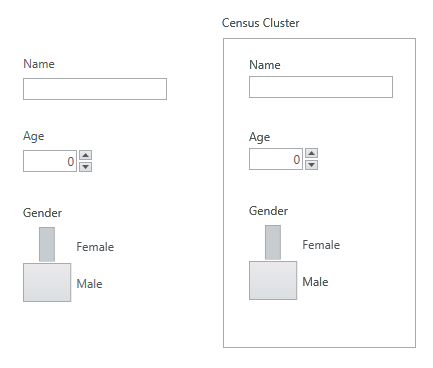 The following images show Name, Age, and Gender controls as individual elements versus the same controls in a single Census Cluster control.